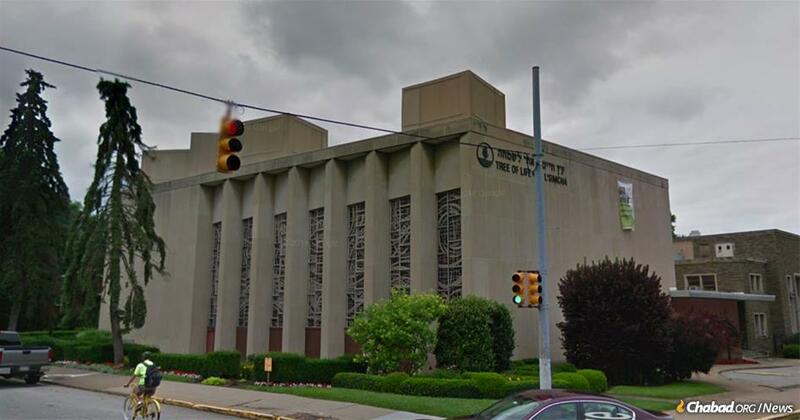 An anti-Semitic gunman shot and killed at least 11 worshippers in the midst of Shabbat-morning services at the Tree of Life synagogue in the Squirrel Hill section of Pittsburgh, Pa.
A gunman shouting anti-Semitic epithets burst into Tree of Life synagogue in the Squirrel Hill neighborhood of Pittsburgh, Pa., and opened fire during Shabbat-morning services, killing at least 11. Six people were wounded, four of them police officers responding to the shooting. There are multiple vigils going on throughout the city, said the rabbi. One began at 6 p.m. and another is beginning at about 9 p.m. Yet another is taking place in a nearby university. The shooter, identified as Robert Bowers, 46, was armed with a semi-automatic rifle and three hand guns. After police rushed into the building, he shot two officers, and then barricaded himself in a room before being taken into custody and hospitalized with multiple gunshot wounds. The gunman had a history of virulently anti-Semitic online posts. The synagogue is in the Squirrel Hill neighborhood, which has one of the largest Jewish populations in Pennsylvania. There are about 15,000 residents in the area, comprising about 23 percent of Pittsburgh’s Jewish community. Vice President Mike Pence called it an attack on the First Amendment’s freedom of religion. “Now I’m just sad,” Jeff Finkelstein, CEO of the Jewish Federation of Greater Pittsburgh, told reporters. Israeli Prime Minister Benjamin Netanyahu said he was “heartbroken and appalled” by the shooting at the Tree of Life synagogue in Pittsburgh. The synagogue shooting is being considered as a hate crime and will fall under federal investigation, he said. Officials added that there appears to be no active threat to the community after the shooting. UNITY Why not protect the synagogues before this happens. My heart , my soul hurt for these families and first responders and the community at large . The gunman had a history of anti-Semitism, he should have been on watch list . What fault was it of theirs they had to die? And they died to sanctify the Name Of G-d. Humans have free will but how can G-d show justice when the righteous fall and the wicked are spared? We have the right to reproach Him for allowing such a mockery to be made of His Name. For we do not love Him any less but senseless evil is an assault on our notions of all that’s good and decent in the world. I wish to extend my most sincere condolences to all the families and the community during this most difficult time. This is a tragedy that cannot be expressed in words.